The video above is a segment is a portion of yesterday's White House Press briefing. Its focus is Donald Trump's tweets from earlier in the day regarding Mika Brzezinski and Joe Scarborough - wherein, according to both Democrats and Republicans, the President was particularly derogatory. Like most of us, Deputy Press Secretary Sarah Huckabee Sanders is not particularly adept at suppressing her body language. Note Ms. Huckabee Sanders' left arm. With high frequency and moderate amplitude, her elbow moves laterally as she speaks. This is an example of a "Tic" - and during yesterday's press briefing this tic behavior was significantly amplified. Tics are by definition not involuntary - rather they're "semi-voluntary" or "unvoluntary" actions. More specifically, tics are voluntary responses to a premonitory and unwanted urge. Said another way, they are "irresistible urges, which are eventually become expressed". Intriguingly, tics very often increase in the context of different emotional states. Sometimes these are negative - such as frustration or anxiety - although they can be triggered by positive emotions as well - like excitement or anticipation. They can even be caused by boredom. What other body language signals, verbal language, and paralanguage displays of Ms. Huckabee Sanders' tells us that her tic is secondary to anxiety? Summary: Deputy Press Secretary Sarah Huckabee Sanders' exhibits classic tic behavior manifested with movements of her left arm/elbow. 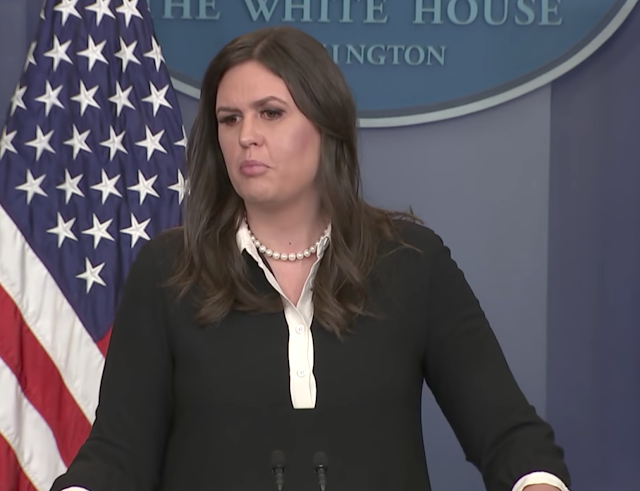 During yesterday's White House press briefing, regarding the President's Tweets about Mika Brzezinski and Joe Scarborough - Huckabee Sanders' tic was significantly exacerbated due to her heightened anxiety.